Good preparation is the key to a successful trek. I found being prepared physically and mentally made the trek a far more enjoyable one. The body needs to be able to get up at 5am, after sleeping in a tent, and trek for 6 – 8 hours and repeat this for eight days straight. I went to my local TMA clinic as being appropriately vaccinated and medicated was important for my peace of mind. I could see how easily an injury could occur on this trip. A team member did come down with diarrhoea. I was surprised by the lack of mosquitoes though, only three weeks prior, they had been prevalent according to the trek leader. I was in awe of what our Aussie soldiers had gone through in 1942. 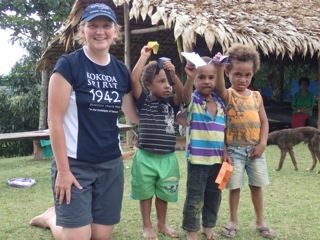 The words “Sacrifice, Endurance and Courage” so aptly described how they coped with all that Kokoda had thrown at them. A dawn service was held at the Isurava War Memorial site and, for me at least, it was emotionally charged and unforgettable. We visited the various villages along the way andI loved the moments with the children. I took gifts of Frisbees, pencils, skipping rope and loom bands. It was a pleasure to see that such simple things brought so much pleasure and joy. The trek was arduous. 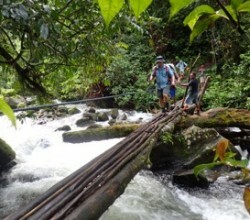 Nothing locally compares to the terrain on the Kokoda Track. The root systems of trees were so entwined I could barely place a foot in between them. The descents were steep and slippery. There were never ending inclines, stifling humidity, rocky terrain, numerous creek/river crossings, and muddy sections. At times, the track could be barely seen, let alone followed. 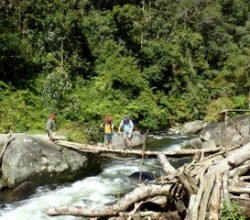 Luckily our porters were amazingly fit men, were very supportive, and knew the terrain. There were times travelling up those relentless hills that I needed to remind myself of our trek leader’s first piece of advice, “you will complete this trek by putting just one foot in front of the other”. Out of completing this amazing journey, with all its challenges, has come a feeling of deep satisfaction and empowerment. If you get the chance to do it, with preparation go, just go.